There are four broad topics covered in Agile Project Management: opportunity, principles, framework and practices. The opportunity lies in creating innovative products and services-things that are new, different, and creative.These are products that can't be defined completely in the beginning but evolve over time through experimentation, exploration, and adaptation. 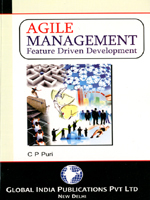 The book discusses the Agile Revolution; describe the value and principles that actuate APM; cover the APM process framework and individual practices; examine how agile principles are used and underscores; and how APM helps address the changing nature of new product development.